With 300 Watts per channel and incorporating all the technology that makes McIntosh famous, not only for the incredible build-quality and durability, but its ability the drive any speaker and deliver beautiful music that is unforgettable! One listen to a McIntosh amplifier is all it takes! With patented Power Guard circuitry that prevents harmful amplifier distortion from getting to your speakers and Sentry Monitor that prevents amplifier damage from speaker or wire shorting. 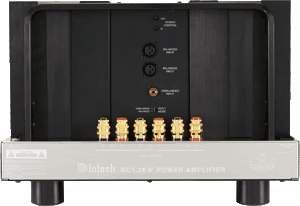 The McIntosh MC-302 also includes all of their well-known patented amplifier technologies such as Power Guard that prevents harmful amplifier distortion from getting to your speakers and Sentry Monitor that prevents amplifier damage from speaker or wire shorting. Also included is their new front panel with their famous "blue-eyed" VU power output meters that are now backlit with fiber-optic LED's for a brighter display and visually stunning appearance. A McIntosh amplifier will be the most intelligent purchase you can ever make! Amplifier Power 300W min. (stereo) or 600W min. mono continuous average power output from 20Hz to 20kHz. 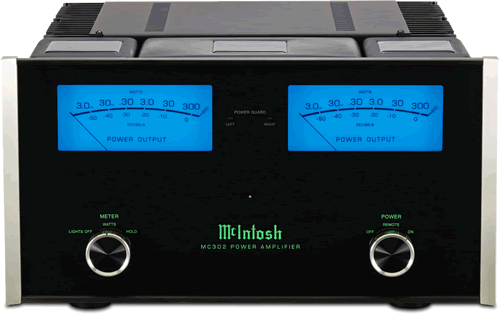 The time-proven amplifier technologies of the new McIntosh MC452 result in an amplifier that will last a lifetime, both in enjoyment and appearance. This is their most powerful stereo amplifier, with over 450 Watts per channel, will easily and effortlessly deliver beautiful music with any loudspeaker! The sound of the new McIntosh MC-452 is incredibly rich, and full, with a soundstage that far extends beyond the loudspeakers both in width and height. The bass is tight and quick, and with the new Thermal-Track output transistors assures that you'll always have marvelous sound quality. Rated at 450 watts per channel, from 20Hz to 20,000Hz at 8 Ohms RMS, the new McIntosh MC-452 is their most powerful stereo amplifier and one of the most impressive sounding amplifiers that is available! Every McIntosh amplifier, and every product they manufacture for that matter, is handcrafted by a dedicated and passionate group in Binghamton New York. One look at a McIntosh product is all it takes to appreciate the craftsmanship and attention to detail that goes into every product they manufacture. Patented technologies like Power Guard, which prevents any harmful distortion coming from the amplifier when it is asked to deliver more power than it's maximum power, to ever reach your loudspeakers (and your ears) and also keeps them in tip top condition so they don't degrade from this harmful distortion. The MC-452 amplifier will breathe new life into you music system and your favorite music that you will feel like you are rediscovering it for the very first time! 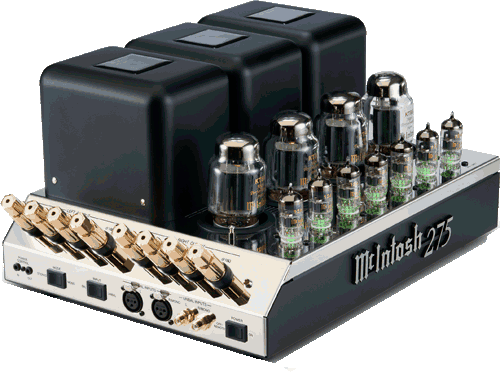 The new McIntosh MC-452 is now on display at The Stereo Shop. Amplifier Power 450W min. (stereo) or 900W min. mono continuous average power output from 20Hz to 20kHz. 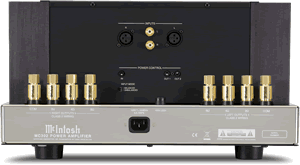 Mono amplifiers offer many advantages; by using an amplifier for each channel eliminates any interaction or crosstalk between the channels. 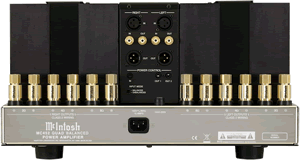 Stereo separation and depth of your music is more life-like by using dedicated amplifiers for each loudspeaker. Also if the user wants to expand into multi-channel, such as Home-Theater, it is as easy as adding the appropriate number of additional amplifiers! 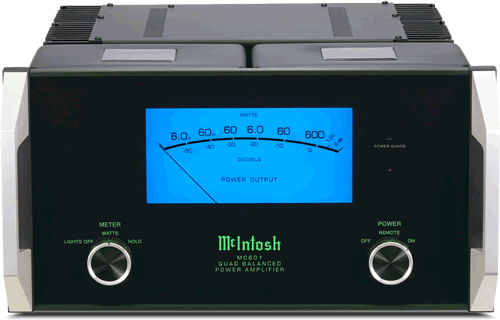 McIntosh has been manufacturing some of the most powerful and musical sounding amplifiers for over 60 years! 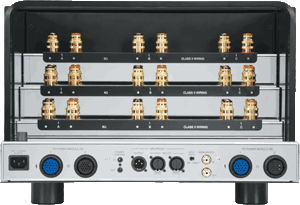 And by using some of most advanced technologies such as Quad-Balancing which greatly improves the amplifiers' signal to noise ratio to over 124dB! 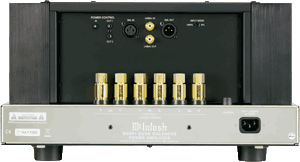 This 600 Watt mono amplifier has the capability to deliver 1800 Watts into low impedances! 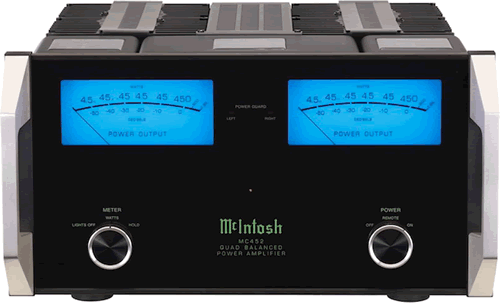 The look and build quality is classic McIntosh; between the beautifully crafted glass front panel, to the famous blue, true-power VU watt meter, to the new fiber-optic lit front panel. And with Power Guard, which prevents any harmful distortion from ever reaching your loudspeakers! This is an amplifier that will provide both the ability to drive virtually any speaker, but do so effortlessly and musically! Amplifier Power 600W min. mono continuous average power output from 20Hz to 20kHz. 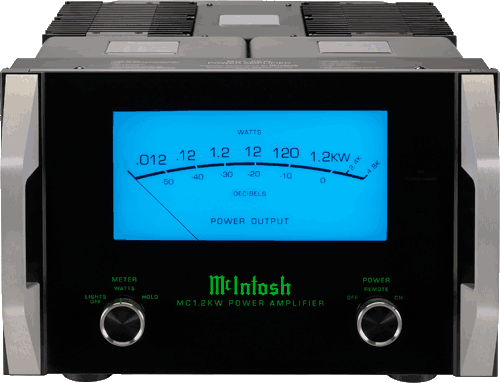 The McIntosh MC1.2KW 1200 watt mono-block power amplifier is their most powerful amplifier they manufacture; second only to the 2000 watt McIntosh MC2KW! It features a Quad-Balanced design that virtually eliminates all distortion and greatly improves the amplifier's signal to noise ratio to over 120dB! This gives you not only an incredibly powerful amplifier; but does this with less noise than a 1 Watt amplifier; "the impossible combination!" But it is possible with the McIntosh MC1.2KW! And with their patented Autoformer ensures that the amplifier's full power will be delivered regardless of what type of loudspeaker is connected to! This means you get all the power that you paid for! The McIntosh MC-1.2KW can drive even the most demanding speakers with ease; and provide the utmost musical and powerful engaging performance that must be experienced! There is also an extra large VU watt meter located behind a stunning hand crafted glass panel that shows the true power output being delivered to your loudspeakers. The MC-1.2KW is now on display in our showroom for your evaluation and ready to astonish you with its power and grace! Amplifier Power 1200W min. mono continuous average power output from 20Hz to 20kHz. The MC2KW Monoblock Power Amplifier is designed to exceed the demands of true lifelike playback level, delivering 2000 watts of continuous power and 8000 watts peak power. Shear power output is but the beginning of the story, however. The MC2KW features McIntosh Quad Balanced Circuitry which, in the process of creating such extraordinary power, actually cancels virtually all noise and distortion. The MC2KW's unique design incorporates three modules. Two 1000-watt Power Modules each contain half the balanced circuitry and a power supply. The Output Module houses the input and output connections, meter, output autoformer, and functions as the control center. The bifilar-wound, mirror-image output transformer combines the two signals from the Power Modules, cancelling noise and distortion while summing the power output. Amplifier Power 2000W min. mono continuous average power output from 20Hz to 20kHz. THD Maximum Total Harmonic Distortion at any power level from 250 milliwatts to rated power output is 0.5%.